People typically position their outdoor kitchen and patio pieces close together because they're limited on space, but if you have the real estate to spread out your backyard living space, then take it! It doesn't have to be a spiral staircase or anything, but installing a few steps that lead from your kitchen to your dining area will provide more opportunity for movement, plus it adds a level of luxury to the dining area by setting it apart from the rest of the kitchen. How much time do you spend just standing by the grill? Resist the urge to open the grill or flip the meat more often than you should by giving yourself something else to do instead. A chin-up bar, for example, offers the perfectly accessible distraction that will get you moving while you're grilling. In between chin-ups, you can work on getting that perfect char on your steak. It's fun to swivel in your chair; you don't even think about the fact that you're also working out your abs while you do it! So, instead of getting stationary bar stools for your outdoor kitchen, opt for the chairs that swivel, so you can move while you hang out in one of your favorite spots. Patios are such nice places to relax and do a little yoga (if that's your thing). The only problem is, patios usually have concrete floors or sometimes wood decking with ridges. Either way, such flooring is not very comfortable when you're doing shoulder stands and such. When you're in the design phase of creating your outdoor kitchen, dedicate a section of our outdoor living space to low impact flooring. You may want to install a patch near the fireplace if you like hot yoga, or you may decide to put it in the corner of your kitchen that has the best view. In order for this idea to work, you must first build a very sturdy pergola. The last thing you need is for your entire pergola to come crashing down on your grill, fire pit, or family when you attempt to ascend the rope ladder. The second thing to consider is how you will position the ladder so that it looks purposeful and flows with the rest of your outdoor kitchen. You want your outdoor kitchen to be a place that allows you to stay active and fit, but you do not want it to look like a kitchen that's been repurposed as a fitness center. Consider installing the ladder next to a rose trellis or porch swing. If the rope does not suit your decor, you may prefer to use a wooden or vintage metal ladder instead. Swimming pools and hot tubs are very logical extensions of outdoor kitchens. Not only is it nice to be able to grill by the pool, but it's also nice to burn some calories before you even fire up the grill — you know, swim some laps and really work up an appetite. After you've enjoyed a big meal in your outdoor kitchen, you can unwind in your hot tub. Even though you're not swimming laps, you'll move a lot more in there then you would if you were sitting in a chair. 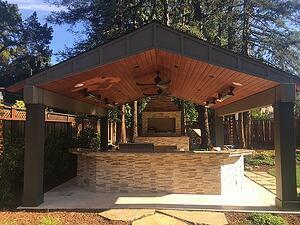 Contact Unlimited Outdoor Kitchen to work with a professional designer on your dream outdoor kitchen! We'll focus on your unique preferences, whether it's movement or something else. Click on the banner below to get started today!